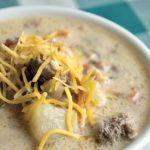 A bowl of hot homemade soup is my go-to comfort food and this recipe for cheeseburger soup made in the slow cooker is one of my families favorite soup recipes. It’s a frugal soup too, with hamburger meat as the main ingredient and everything else is pretty basic too. 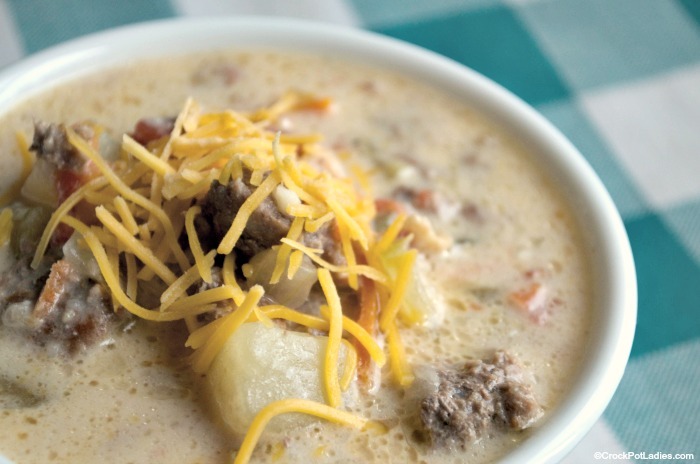 Bacon and cheese, tomato, onion, garlic and even some potato is simmered in chicken broth with some basic seasonings. Then, everything is thickened up to make for a pot of creamy and cheesy soup that everyone in the family will love. You can serve this soup alone as a nice lunch or for dinner, I like to make a nice side salad and serve with some crusty bread for dipping into the soup. Top each bowl of soup with additional cheddar cheese before serving and you have one tasty soup and salad dinner! 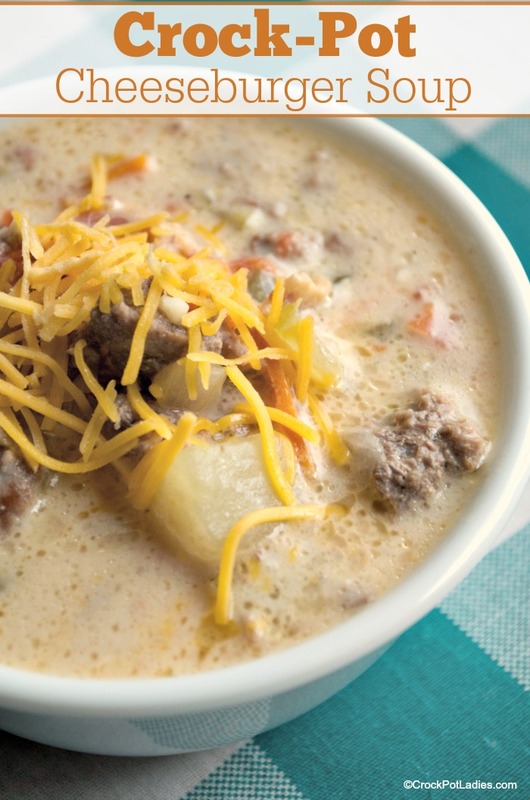 All the flavors of a cheeseburger are in this cheesy and creamy soup. Serve with a nice side salad and some crusty bread from the bakery for a delicious dinner the whole family will love. In a medium skillet on the stove-top, cook and crumble the ground beef until no longer pink, drain off fat and add meat to a 6 quart slow cooker. Saute the diced onion in the same skillet until they start to soften and turn translucent. Add cooked onion to the slow cooker. Add the tomatoes, cream cheese, cooked bacon, chicken stock, potatoes, carrots, garlic, celery, salt and pepper to the slow cooker and stir to combine. In a small bowl whisk together the milk and flour to create a slurry. Slowly stir the slurry into the soup breaking up any cream cheese that has not melted yet. Add the shredded cheese to the slow cooker. Recover slow cooker and cook for an additional 10 to 15 minutes or until the soup has thickened. Ladle hot soup into bowl and garnish with extra shredded cheese if desired. Save time by cooking your ground beef and bacon ahead of time. Both can be cooked, placed in freezer bags and stored in the refrigerator or freezer until you are ready to use them. This recipe was first published in May 2013. And we have decided it was time for an update. New photos, as well as special diet and nutritional information has been added. We hope you enjoy!